Born digital images of the College of Performing Arts theater performance of "The Merchant of Venice," a play by William Shakespeare, directed by Thomas F. Bradac, and starring Michael Nehring as Shylock. 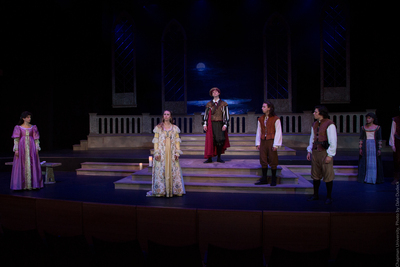 Other principal members involved in the play were Keith Bangs (scenic design), Karen Fix Curry (costume design), Don Guy (lighting design), William and Jennifer Georges and George Mullen (original music), Amanda Zarr (associate director), Matt Eisenmann (projection design), and Alina Novotny (production stage manager). Photographs provided by Dale Dudeck.